JD PAT Testing based in South Shields, Tyne and Wear providing services as a PAT Tester. Harrier PAT Testing – Berkshire & South East based in Ascot, Bershire providing services as a PAT Tester. Busy Bee Events Corp Ltd based in Basingstoke, Hampshire providing services as a PAT Tester. 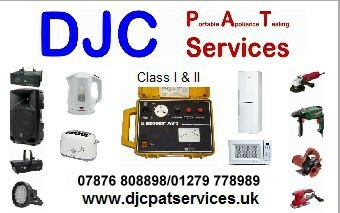 DJC PAT Services based in Buntingford, Hertfordshire providing services as a PAT Tester. Fused Uk Electrical Ltd based in Leeds, West Yorkshire providing services as a PAT Tester.